The Elatest® determines the density of polymers, in particular of rubber and unvulcanized rubber compounds - a decisive importance for rubber processing, both during recipe development and for continuous production control. The sample material is compressed in the measuring cylinder. Any gas contained in the sample escapes during this compression process. Under a preset pressure, the moving piston reaches a position which is specific for each individual sample, i.e. the sample is compressed to its specific volume. The stroke of the piston is measured by a displacement transducer and transmitted to the computer. From the sample weight and volume, the computer automatically calculates the density. The software of the implemented computer is user-friendly and is operated via a touchscreen. 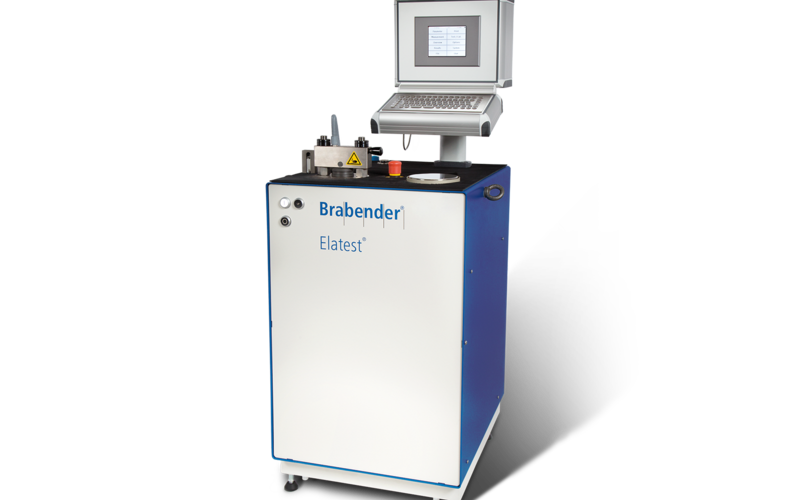 Excellent reproducibility of the measured values, easy handling, and the reliability make the Elatest® best suited for both, for production control and for research and development. The determination of density is defined by an electronic scale and an electronic position sensor. Each measurement starts with measuring the sample weight. Following that, the sample is put into the measuring cylinder and compressed by the piston. Thereby the piston reaches a sample-specific position, i.e. the sample is compressed to its specific volume. For the determination of the sample volume, the difference between the piston lift is measured with empty cylinder and with filled cylinder. The sample density is automatically determined and specified by the sample weight and the determined sample volume. From the sample weight and volume, the integrated computer automatically calculates the density. Use the software easily with the touch screen. Excellent reproducibility of the measured values, the easy handling, and the reliability make the Elatest® best suited for production control as well as for research and development.